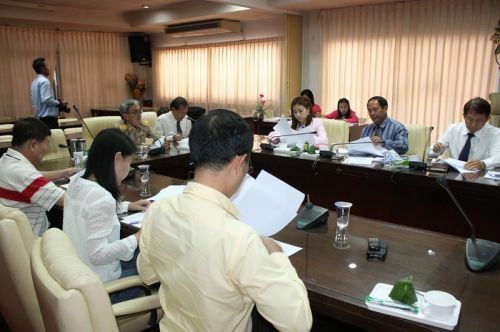 President Paiboon Upattising on January 30 chaired a meeting to prepare for a new intake of students into PPAO schools for the academic year 2015, at the meeting hall in PPAO offices. Present at the meeting were: President Advisor Boonserm Suwannarathphoom, Council Chairman Theera Jiasakul, Council Members Prasit Sinsaowapak, Wisansaya Polsin, and Supreeya Iam-wiwattanakul, Director of Education, Religion and Culture Ouiporn Sakultan, as well as administrators and teachers from PPAO schools. The meeting discussed the planning and procedures for accepting new students and official announcement of school fees. The panel also agreed to the dates of student application, exams, and registrations as follows: Students Application AcceptedEntrance Exam Result Posted Registration Present in School Pre-school February 9 – 13 February 22 February 24 February 25 February 28 Primary 1 (Por 1) March 6 – 10 March 13 (draw lots) March 13 March 19 Secondary 1 (Mor 1) March 20 – 24 April 5 April 7 April 8 Secondary 4 (Mor 4) – students coming from other schools March 20 – 24 March 29 April 3 April 6 April 9 Following is the timetable for schools that provide special program and English program (EP): Students Application Accepted Entrance Exam Result Posted Resigtration Pre-school and Primary 1 February 9 – 13 February 22 February 24 February 25 (February 28 present in school) Applications for this last category will be opened from 8.30 am – 4.30 pm daily (including weekends). Students should apply directly to schools they wish to study.